Ash and I got together this weekend for another hummus date! We started with a PERFECT yoga class that has set the gold standard for yoga classes to come — it was a vinyasa class and had a really great flow that kicked our butts. I’ve started running this year, and have noticed that I need some better strengthening and stretching work to support my running. Well, our teacher is a runner and this class might as well have been called “Yoga for Runners” — it was so perfect, AND I finally got my hip flexors stretched out! I simply cannot wait for next week’s class! After our yoga adventure, we had taco bowls full of veggie goodness, and then headed to my kitchen for some hummus time. It’s been so fun to collaborate with Ashley on all of our hummus posts, and yesterday was no exception. We had so many good giggles in the kitchen while creating this week’s new hummus recipes. 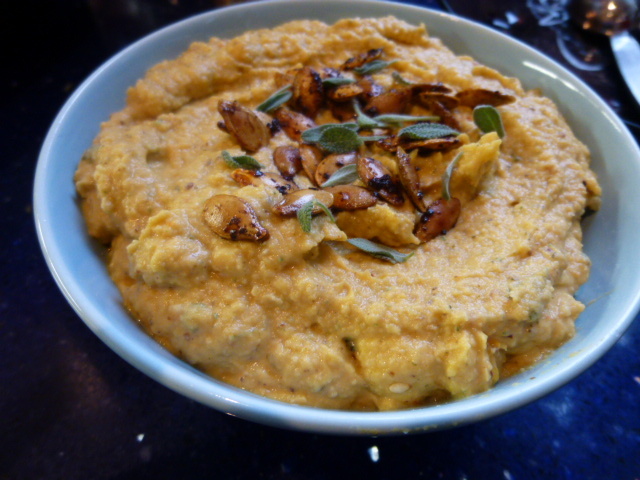 The weather here has shifted to be much cooler, and with the change in weather, we thought we’d focus on fall hummus! So we came up with two hummus recipes that use butternut squash — this savoury one: Roasted Butternut Squash Hummus, and stay tuned for a sweet one! 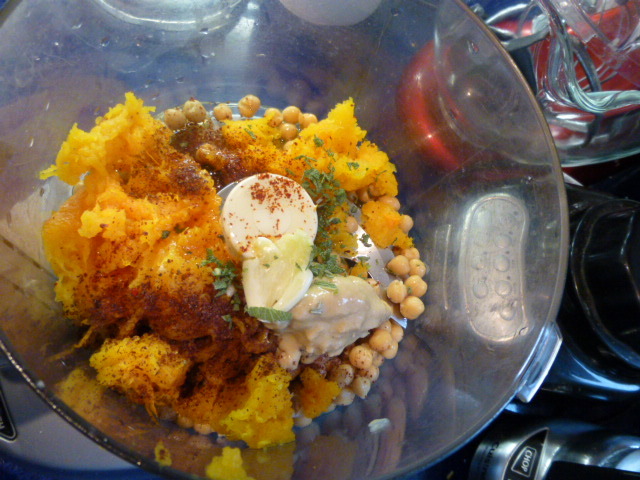 We really liked both of these hümmi as a butternut hummus pairing, so both recipes use a grand total of one (large) can of chickpeas and half a butternut squash. Feel free to double the recipe if you’re just making one or the other. You can use any winter squash here, butternut squash is usually easy to find, but kabocha, red kari, pumkin, or delicata would all be great here! Roasting a squash is easy. You can roast it with or without oil and spices to make it taste just how you like it (check out my post on How to Roast Squash). I roasted this one without anything on it — just put it cut-side down on a foil-lined baking sheet and roasted it at 425F for 45 minutes. I kept it plain so we could use it for both the sweet and savoury hummus recipes! 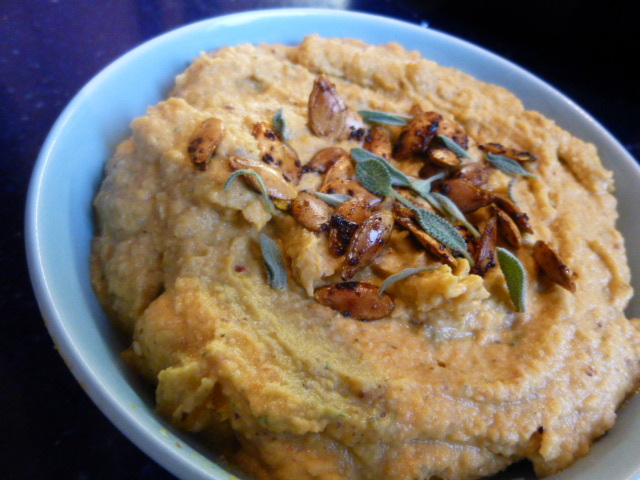 For this savoury butternut hummus, we decided to get the taste of fall by using some fresh sage. I think sage makes everything taste like Thanksgiving, and I love it. In fact, this would be great Thanksgiving hummus. Eat and enjoy the fall flavours! What a great hummus for the fall! Yum! I’d love a batch of this to have with snacks. hummus and roasted butternut squash are one of my favourite meals. I have never thought of adding them together..and with sage! Fantastic idea. It would be magic with deep fried sage leaves on the top too! THANK YOU! Just in case the butternut squash isn’t enough, let’s add za’atar. Yes, please. Ooh, perfect for fall! I love the seeds on top, looks incredible.